That chocolate bar you’re eating might just be smarter than you think, it may actually be location aware. Nestlé have distributed 6 chocolate bars somewhere in the UK outfitted with GPS trackers embedded in the packaging. 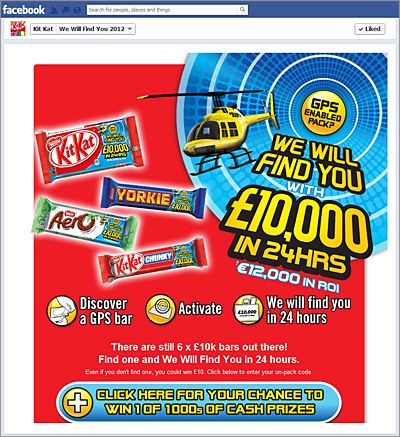 Once a buyer activates the GPS tracker, Nestlé’s prize team will locate them within 24 hours and deliver a check for £10,000. As a secondary part of the promotion, Nestlé is also running a 2-week out-of-home campaign on 3,000 posters outfitted with NFC and QR code touchpoints. The OOH touchpoints direct users to a mobile-friendly site where they can enter an on-pack code for an opportunity to win one of 2,000 £10 prizes. The ‘We Will Find You‘ campaign was created by JWT London.